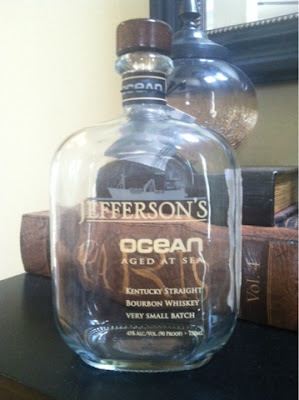 Jefferson's Reserve has never shied away from trying new things with bourbon, and there was a ton of promotion for their ocean voyage releases. The general premise is that they took bourbon barrels and placed them on a bot to age as the boat traveled from port to port through some warmer climates. This would allow the bourbon to interact with the wood more and draw out some additional flavor. I was very intrigued and eager to try one of these releases, and when I saw bottles of what Jefferson's called "Voyage No. 3" (or, in other words, batch #3), I felt it worth giving a shot. On the first pour, I noticed primarily a caramel scent on the nose. There was something else to it, but I couldn't quite place my finger on it. That was until I took my first sip, and then it was unmistakable. This bourbon is actually very briny. I didn't expect the salt from the ocean to make its way into the bourbon, but there is no question that's what happened here. The caramel flavors are also there, making it a salty/sweet bourbon. However, the saltiness is not exactly a good thing. The brininess of this bourbon overwhelms, and it's very hard to get past that tangy, pickle-juice type flavor to really enjoy it. It's a shame, because, although it's faint, there were hints of some very yummy flavors, reminiscent of white chocolate covered pretzels. Those flavors were buried, though, and difficult to really enjoy. After letting the bottle sit for a while before I went back to it (it wasn't exactly my first go-to when I wanted a drink), I did notice that the brininess had subdued a bit, but it still managed to overwhelm. Unfortunately, the sweet, salted caramel flavor of the bourbon likewise diminished some as well. It was more drinkable, but not necessarily more enjoyable. Ultimately, I take this bourbon for what it is--an experiment. I've had great experience with Jefferson's traditional bourbons, and will continue to go back to that well, but this particular experiment, to me, is a bust.